Since I’ve been studying natural horsemanship, I’ve come to realize the importance of understanding good biomechanics. Noun: biomechanics; 1. The study of the mechanical laws relating to the movement or structure of living organisms. Fascinating, I know. But, really, it is. To me and to many of my fellow natural horsemanship enthusiasts, the art of good riding is to become one with the horse—emotionally, mentally, and physically. Since horses do not have the luxury of verbal language, it is up to us to hear and read their body language and to communicate clearly with ours. It only makes sense that if we want better communication with our horses, we must understand our own biomechanics when we ride or work with them on the ground so that we cal allow and also influence the horse’s biomechanics to work properly. 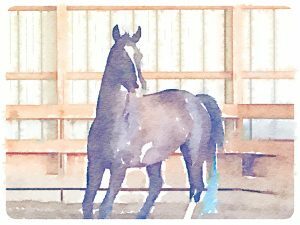 In the first module of the course, we are focusing on foundation—assessing our own foundation with our horse and then working to build an even better one. In the first lesson, we worked on yields—using our own intention, energy, and body to influence the horse to move certain “zones” or parts of their body, both on the ground and in the saddle. 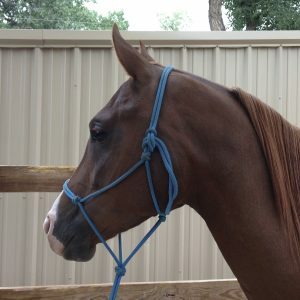 I worked with three of my horses on this lesson and received some interesting feedback. 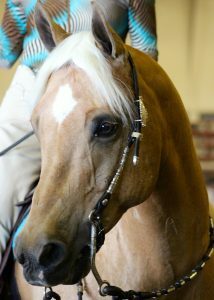 Handsome, my lovely Half-Arab palomino gelding, mostly a right-brained introvert, became quickly confused and overwhelmed. I realized that in trying to be super subtle, I was only mucking things up for him. I had to turn up my focus to be clear with my energy and my body isolation, all the while moving slowly and taking lots of breaks. Stormy, my sassy, right-brained extrovert (she’s so Type-A! Ok, I know I am anthrophomorsis-ing, but it takes one to know one) caught on right away. She is the horse who always calls me out when I am not communicating clearly. Fortunately for her, I did all of my experimenting on Handsome. Next time, she goes first! Chaco, my gregarious left-brained extrovert needed a bit more convincing, but he actually comes to life and decides to “join the party” when we have good, clear, communication. He forgets about trying to resist and gets into the flow. He is so much fun to ride. We ended up having an engaging and focused session. Chaco – I used an app called Waterlogue for this pic. Cool, right? The next step in the process of creating a good foundation is to practice these yields until they are solid (not perfect) and then move on. I can’t wait to start the next lesson and share it with you. Please feel free to comment or ask questions. I’d love to hear about your journey with your four-legged equine fur babies.